The misty, rugged North Coast lies in stark contrast to the sunny, sandy beaches around the southern cities of San Francisco, Los Angeles and San Diego that epitomise the Californian beach lifestyle. Stretching north of San Francisco to the Oregon border there are endless miles of rocky coastline, with panoramic views of towering cliffs and crashing waves. Aside from seascapes, the region boasts some of the oldest and tallest trees on earth: magnificent coastal redwoods that are thousands of years old and hundreds of feet tall. A huge network of national, state and regional parks have joined together to preserve the acres of remaining old-growth redwood forests threatened by heavy logging. The State Parks of Prairie Creek Redwoods, Del Norte Coast Redwoods and Jedediah Smith Redwoods make up the Redwood National and State Parks. The redwood forests include giants that grow to more than 300ft (91m) tall. The parks offer miles of hiking trails, camping and picnicking, scenic drives, rivers and an abundance of wildlife including bears, elk and deer. 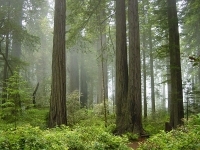 Prairie Creek is the most popular park containing herds of Roosevelt Elk, weighing up to 400 pounds (181kg); trails with spectacular coastal views; Tall Trees Grove sheltering the world's tallest tree at 367ft (112m); and the impressive Cathedral Tree where nine massive trees have grown together from one root. Further south the Humboldt Redwoods State Park, California's largest state park, is the site of the 33-mile (53km) long Avenue of the Giants, a spectacular scenic drive lined by some of the world's tallest trees. Along the route are several 'attractions' such as the hollow Chimney Tree where the Hobbit has his mythical home, and a Drive-Thru Tree that allows tourists to drive through a living hollow redwood. Jedediah Smith Redwoods State Park boasts the most astounding drive in the Redwoods National Park District, the Howland Hill Road that winds through incredibly magnificent old-growth forest that is considered to be one of the most beautiful areas on earth. We are looking for contributors for our North Coast Redwoods District travel guide. If you are a local, a regular traveller to North Coast Redwoods District or a travel professional with time to contribute and answer occasional forum questions, please contact us.